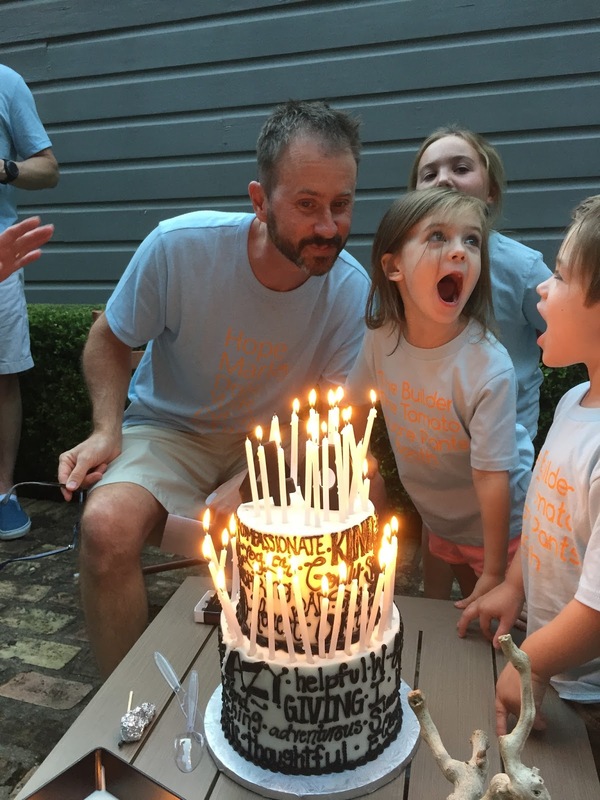 Celebrate Always: Bob turns 40! 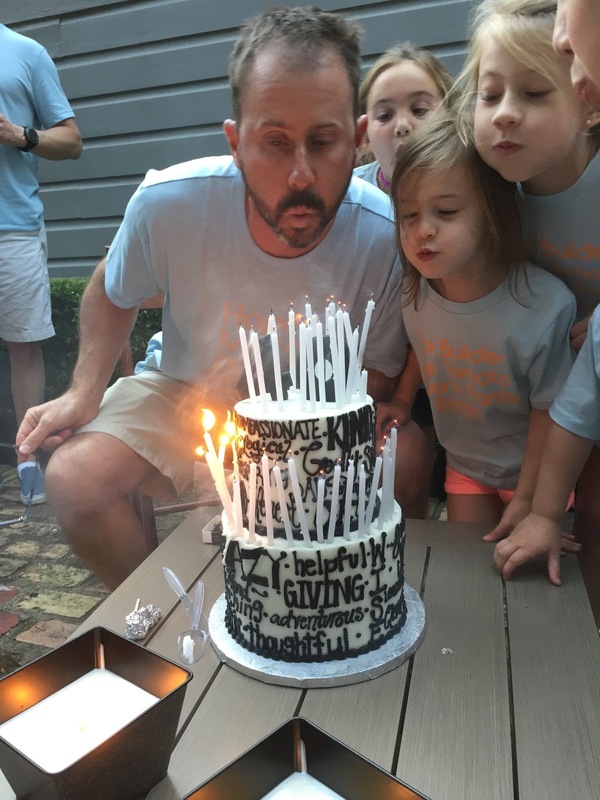 My sweet sister-in-law hosted a family dinner to celebrate Bob turning the big 40. (This was back in October) She had a fun food truck come for dinner and the rest of the evening was a complete surprise to Bob. Bob's love language is words of affirmation. That is probably my weakest one. I am a words person but not spoken out loud words. I like to either do it through a letter, text, email or shirt (duh). 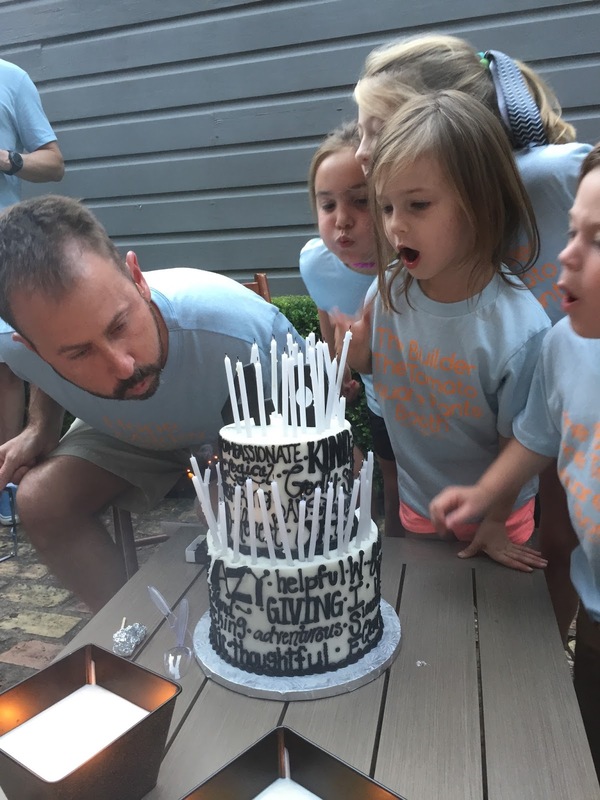 During one of Matt Chandler's sermons that we heard during Kanakuk this summer talked about something he did for his daughter's 13th birthday. I knew immediately that I wanted to do it for Bob's 40th. He talked about identity markers, the attributes and character traits God has given each person. For his daughter's birthday he had 13 of her closest family members stand up and talk about 13 different identity markers they saw in her and how God has and will use them in her life. How cool is that?! So I started a secret family email and gave everyone a list of 40 words that described Bob. I told them to pick 5 or 6 per family and then divide them up for who would stand up and talk about each one. 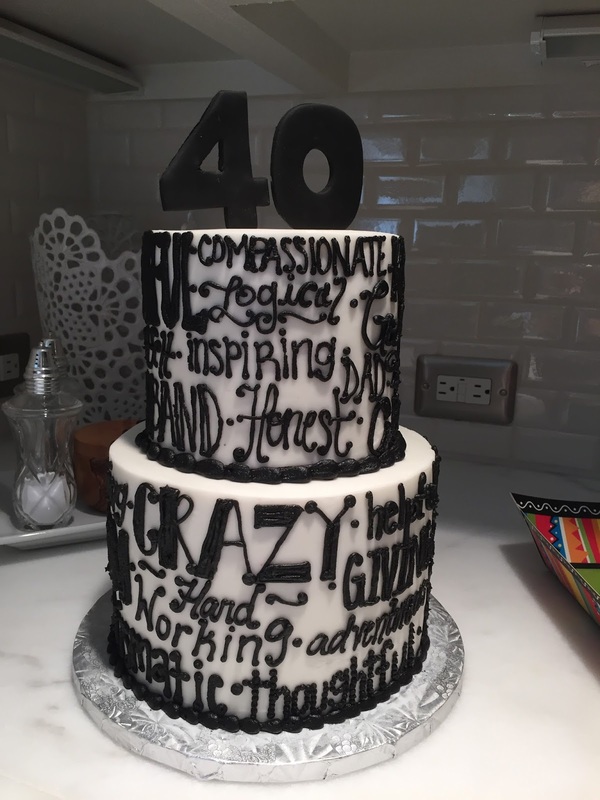 I gave the list of words to the amazing girls at Legacy Cakes and they put them all over his cake. I printed off each trait on a card with the definition. I then hole punched them and stuck a candle through each one. 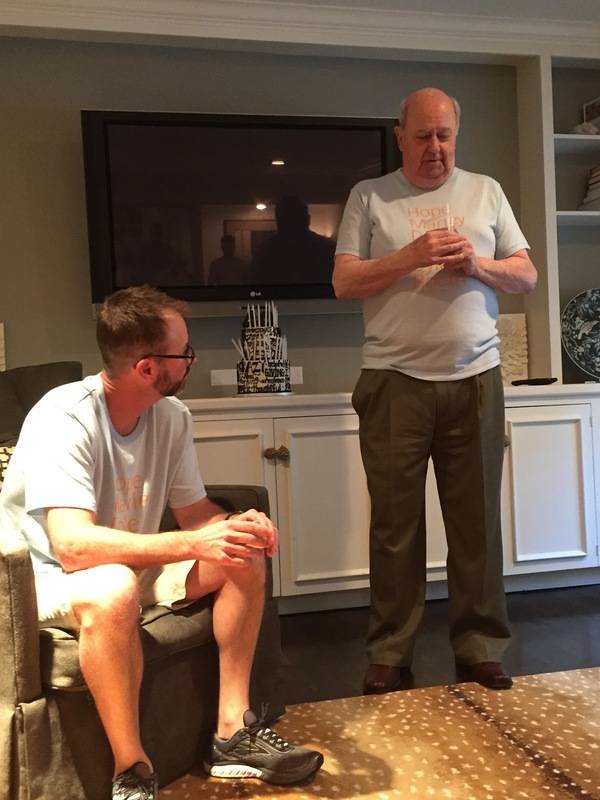 When each person stood up and talked about their word, they would stick the candle in the cake and then give Bob the word card for him to collect on his key ring. Here are his 40 words. Crazy, talkative, perseverance, Dad, Husband, inspiring, strategic, doctor, adventurous, compassionate, charismatic, leader, ambitious, loving, creative, brave, sweet, son, heartfelt, fun, giving, thoughtful, intelligent, courageous, faithful, kind, clever, active, Godly, responsible, honest, helpful, funny, hard working, logical, joyful, wise, skillful, patience and witty. 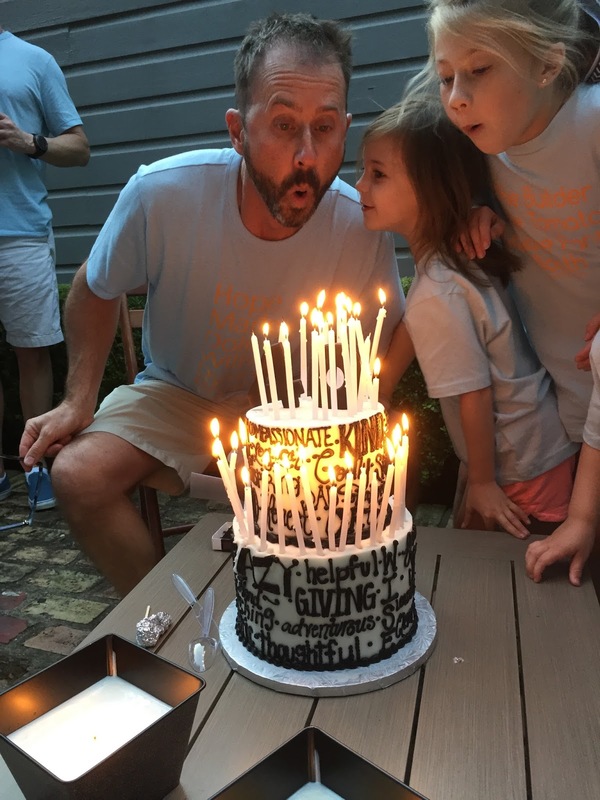 It took over an hour to put all 40 candles in the cake and it was such a special time that I will never forget. It was so cool hearing all the stories and examples of how we all see Bob's strengths. Everyone was in tears, especially Bob. This was truly Bob's dream birthday. He couldn't get over it and was so touched and humbled. After everyone was finished talking about Bob, he pulled out a typed letter that he had prepared to read to everyone. He came to his own party with a letter talking about each person at the party and what they meant to him. The tears kept on coming! It was amazing. It can't be a party without matching shirts! I have actually had this shirt idea in my head for over a year. 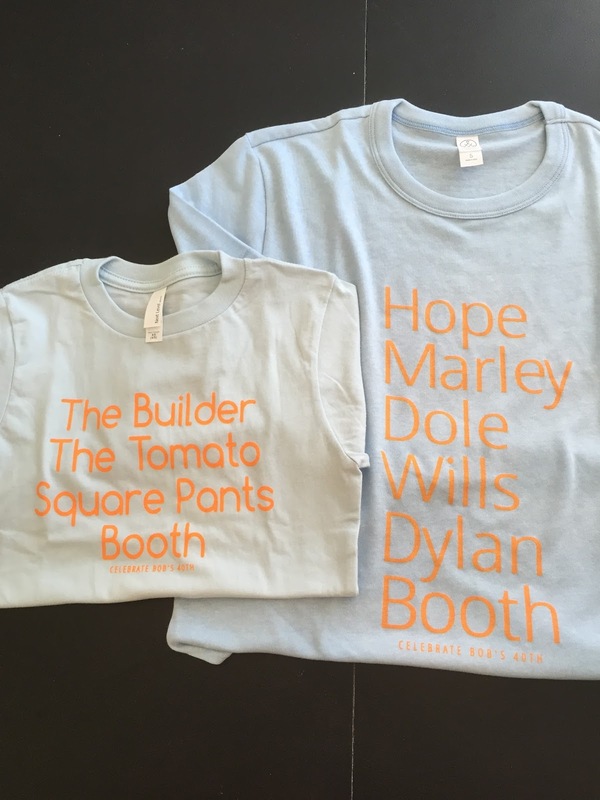 I was so excited about doing a "Bob" themed shirt. It's a list of all famous Bob's by their last name. Ending with the most famous one of all! I made a kid version too. How funny are those WTF koozies?! That was all Bob. He is a clever one. I love you so much babe. May 40 be your best year ever!